Mayor Rahm Emanuel saluted aldermen who he said voted for the public interest over political self-interest. CITY HALL — The City Council signed off Wednesday on a record $589 million increase in property taxes. The vote was 36-14 in favor. The lion's share, $544 million, will be phased in over four years to make state-mandated payments to police and firefighter pension funds. 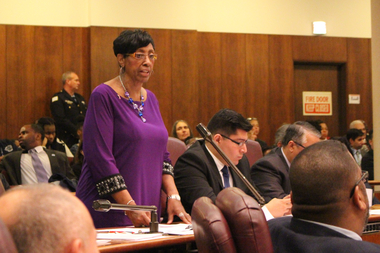 For most aldermen, that argued powerfully in favor of the $9.3 billion 2016 budget proposed by Mayor Rahm Emanuel. "There is a lot going right with Chicago," Emanuel said before the vote was cast, and he pointed to a strong economy and city services. Yet he acknowledged the "dark cloud" in city finances with required pension payments. Ald. Carrie Austin called on her City Council colleagues to be "responsible" and vote in favor of the budget. "There was no other choice," he said, but to increase property taxes. Emanuel acknowledged, "It did come with political risk," but he applauded aldermen who took "decisive and determined action" to right the city's fiscal ship. Quoting a favorite John F. Kennedy line that "to govern is to choose," Emanuel urged the Council to follow his lead, and in the end he applauded those who he said had chosen the public interest over political self-interest. "We have no choice," said Ald. James Cappleman (46th), citing the legal requirement to make the pension payments. "We have to do the responsible thing in this body, and that's to vote yes on the budget," said Ald. Carrie Austin (34th), chairman of the Budget Committee, who scolded her Council colleagues at the start of debate. "None of this is easy," she added, "and I've lifted some heavy budgets." Ald. Patrick O'Connor (40th) repeated the adage that the only things that are certain are death and taxes, but added in this case it was death or taxes — death to the city by a thousand cuts if the taxes weren't approved. Ald. John Arena (45th), who has frequently opposed Emanuel, including a vote against his budget last year, sided with him this time, blaming insufficient pension payments under Mayor Richard M. Daley and a compliant Council in the past. He submitted a resolution calling for more progressive revenue sources in the future on the city and state levels, and also asked Emanuel to accept an elected School Board within a year as the price for supporting a $45 million tax levy for Chicago Public Schools. Yet he added, speaking directly to the mayor, "The voters returned both of us to this chamber, so we're stuck with each other." Arena said the mayor's concession not to privatize 311 services made his vote in favor of the budget possible, and he defended a new fee on garbage collection as "a step in the right direction" to spur residents to reduce the amount of trash they throw away. Ald. Ameya Pawar (47th) called passage of the budget "the right thing to do," but also called for a graduated state income tax and a city corporate income tax in the future, saying, "We need to create the political will for that." Ald. Joe Moore (49th) also supported the budget, calling it a move to "take the bull by the horns." He added, "We have no choice whatsoever but to support this politically challenging budget." Yet Ald. Harry Osterman (48th) swung the other way, saying there wasn't enough belt-tightening in the budget. "Don't we owe to it to the homeowners?" Osterman asked. He also warned the property tax hike would hit renters and small businesses hard as they bear the brunt of the increase. Ald. Carlos Ramirez-Rosa (35th) agreed, predicting that he soon would be confronted by renters saying they'd been "pushed out" of housing by rent increases passed along by property owners. He urged the mayor to raise revenue through the rich who had contributed to his re-election campaign. Ald. Joe Moreno (1st) dismissed that as "hyperbole and pandering" by "so-called leftists." O'Connor too dismissed aldermen who argued, "My community doesn't want this," challenging them to "find the community in the City of Chicago that does." "It's an insane process," said Ald. Anthony Napolitano (41st), comparing the monthlong budget debate to being trapped in a burning basement in his previous job as Chicago firefighter. Yet, while expressing sympathy for the need for a tax increase, he said his constituents had urged him to vote against it, and he did. On top of the record increase in property taxes, the 2016 budget includes a new $9.50-a-month fee for garbage collection, worth a projected $60 million, new rates and fees for taxis and ride-hailing services, worth $48 million, and an amusement tax increase on computer "cloud" services and streaming, worth $40 million. Ald. 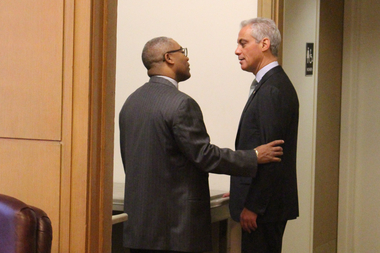 Walter Burnett Jr. and Mayor Rahm Emanuel talk in private before Wednesday's City Council meeting on the 2016 budget. Ald. David Moore (17th) voted in favor of the budget, but sought to isolate a vote against the garbage fee. When the Council disallowed that, he joined the 14 opposed to the budget in voting against a complementary measure on the tax and fee increases. Emanuel later said, "Thirty-five people stood up, stood up for the city's future." Budget Director Alexandra Holt testified during budget hearings that this year's property tax increase would be $318 million, or a 37.7 percent increase in the city's tax levy, with an average increase of 12.2 percent on homeowner tax bills that will come due next summer. Emanuel was working on an expanded homeowner exemption that will ease the burden on all in the city, but erase the hike on homes valued at $250,000 or less. Aldermen, however, proposed a tax rebate instead — an issue to be decided once the General Assembly votes on the homeowner exemption. Ald. Michele Smith (43rd) introduced another rebate proposal Wednesday, endorsed by the mayor, that greased the way for her approval, along with a task force she proposed on city worker absenteeism. The $589 million in new property taxes, including a $45 million tax levy for Chicago Public Schools, cleared the Finance Committee last week by a 17-10 vote, with prominent Aldermen Brendan Reilly (42nd) and Tom Tunney (44th) among those withholding their support. Tunney initially insisted he would not waver, and Reilly said Tuesday he was still considering which way to vote on the final budget. Yet in the end Tunney went with the mayor, while Reilly went the other way. Other "no" votes included Osterman, Napolitano, Ramirez-Rosa, Ald. Scott Waguespack (32nd), Ald. Susan Sadlowski Garza (10th), Ald. Debra Silverstein (50th), Ald. Brian Hopkins (2nd), Ald. Jason Ervin (28th), Ald. Deb Mell (33rd), Ald. Christopher Taliaferro (29th), Ald. Milly Santiago (31st), Ald. Roberto Maldonado (26th) and Ald. Gilbert Villegas (36th). According to City Hall sources, Emanuel was exerting pressure on aldermen to gain their support for a distasteful, but necessary tax increase he cast as "finishing the job" of gaining financial solvency and "stepping up to the challenge rather than stepping aside." Earlier, the mayor pledged to be "fully supportive" of those who backed his budget. 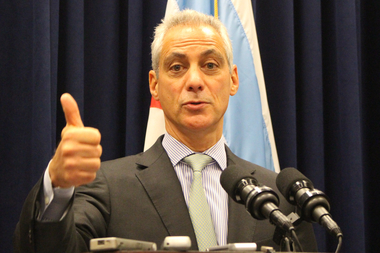 Only four aldermen voted against Emanuel's budget last year. The last time the city made a major increase in property taxes, $87.9 million in the 2008 budget under Mayor Richard M. Daley, the final vote was 29-21.